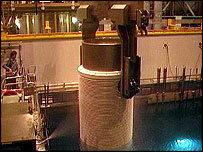 The operator of the Sellafield nuclear reprocessing plant has been fined £500,000 following a radioactive leak. About 83,000 litres of acid containing 20 tonnes of uranium and 160kg of plutonium escaped from a broken pipe into a sealed concrete holding site. The operator of the Cumbrian site, British Nuclear Group Sellafield Ltd, pleaded guilty at an earlier hearing. In August, it was revealed the Nuclear Decommissioning Authority had withheld £2m from the company after the leak. No-one was injured in the leak at the Thermal Oxide Reprocessing Plant (Thorp) and no radiation escaped from the plant in the leak, which was found in April 2005. The company pleaded guilty at an earlier hearing to three counts of breaching conditions attached to the Sellafield site licence, granted under the Nuclear Installations Act 1965. It was fined at Carlisle Crown Court on Monday along with nearly £68,000 in prosecution costs. The court heard that the leak should have been detected within days rather than the eight months it took. Passing sentence, Mr Justice Openshaw said the penalty must serve as a reminder that health and safety was a serious matter and achieving public safety was of paramount importance. In a statement, British Nuclear Group Sellafield Ltd said: "We deeply regret the incident, which clearly should not have happened, though we are disappointed with the size of the fine. "We continue to work closely with the regulators and have implemented new measures to ensure that nothing similar can ever happen again." Director of nuclear safety for the Health and Safety Executive, which brought the prosecution, and HM chief inspector of nuclear installations , Dr Mike Weightman, said the case highlighted the high standards needed in the nuclear industry. He said: "Our extensive investigation into the events in Thorp has shown that British Nuclear Group Sellafield Limited fell significantly short of the required standards for a considerable period of time before the leak was discovered. "Although we stress that there is no evidence of any harm to workers or the public, the leak being contained within a stainless steel lined, heavily shielded cell, there has been a significant prolonged reduction in attention to the high standards demanded, something we are not prepared to tolerate."